Meet the young, but extremely talented and experienced Dr Aleid Koppius from the Netherlands. Since the start of her career she has performed thousands of aesthetic procedures and has trained tens of aesthetic physicians. Dr Aleid Koppius works together with and in the clinic of Raj Acquilla. She is specialized in performing complex injectable treatments, mainly botox and fillers, and is well known for her precision and aesthetic eye. This allows her to do a full face analysis effortlessly and offer a customized treatment plan to every patient. It is her challenge to strive for the most natural result by injecting as little product as possible at the exact right places. Dr Aleid Koppius is praised for her personal approach and clear communication. Patients called her very professional, patient and very empathetic. Until recently Dr Aleid Koppius owned the largest clinic in the Netherlands. Since she co-founded that clinic 4 years ago they grew to an incredible 9 venues and 11,500 patients. In January 2016 she moved to London to broaden her skill set and develop even further. She is now receiving world-class training and works alongside the most well-renowned names in the industry. To stay up-to-date about the most innovative and advanced techniques and procedures, she often travels to international conferences around Europe. That way her patients can benefit from the most profound and leading-edge knowledge available and get the best possible results. Dr Aleid Koppius completed her medical studies at the Amsterdam University Medical Center (VUmc) after studying Psychology for 2 years, which has her special interest. She gained surgical experience at the Department of Plastic, Reconstructive and Hand Surgery at VUmc and participated in several national and international scientific researches (funded by the Dutch Heart Foundation) which she presented at international conferences. 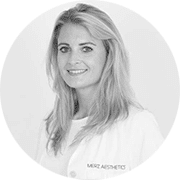 Dr Aleid Koppius is a member of the Aesthetic Society and registered as a doctor in both the Netherlands (BIG) and the United Kingdom (GMC).